The monsoon beckons and with it the need for soups salads and all things soulful. Attaining food nirvana with these delicious dishes is all but a bite away. Mulberry Trail mix: Power-packed with a combination of crunchy mulberry, cashews, peanuts, cranberries, roasted sunflower seeds, pumpkin seeds and sultana raisins – go nuts on our nutty trail mix, the healthiest snack you could ask for! Here's a luscious summer salad which stars the goodness of chipotle-grilled chicken steaks, paired with a colourful ensemble of charred sweet-corn and fresh peppers tossed in chipotle-chilli vinaigrette and placed on a bed of quinoa and lettuce. We've plucked this delish cookie straight out of a fairy-tale! Sweet, buttery cookie dough is dipped in sugary, colourful edible confetti and topped with creamy white-chocolate and sugar coated crunchy apple pieces. A cookie that is truly is as good as it looks! The magic of soups lies in the ability to drown out a weary day’s tiredness with one warm, soul-soothing sip. This creamy roasted onion soup with generous servings of chunks of chicken, chicken ham and leeks cooked in a savoury chicken stock is nothing short of soothing! Plump, ripe tomatoes feature in the delicious soup that will warm your soul – pulled roasted chicken, sautéed peppers, corn, kidney beans teem in a rich, creamy tomato broth that is served with a handful of fried nachos for that lovely crunch! 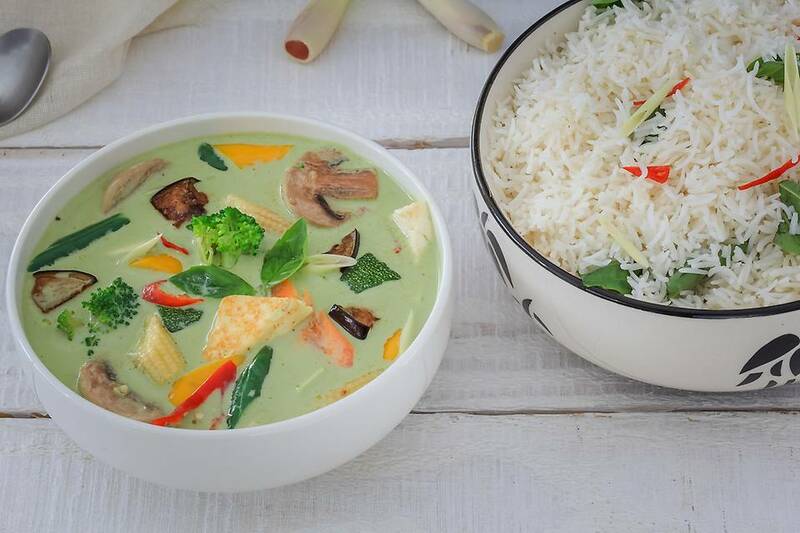 Believed to be invented in central Thailand in the early 1900s during the reign of King Rama VI or VII, Kaeng Khiao Wan or green curry is a lot more pungent and audacious than the red curry. ‘Wan’ in Thai means sweet but is used to describe the colour green rather than the flavour, as the curry isn’t sweet. Our fragrant, creamy vegetarian take on the green curry is imbued with the magnificent flavours and aromas of galangal, kaffir lime leaves and lemongrass. An absolutely fitting tribute to the fragrant curries from Thailand. Served with steamed rice. Since the 70s, quinoa has become quite the fab-food and quinoa-based salads are leading the race! Assorted quinoa is tossed with honey-balsamic infused paneer, assorted lettuce, fruits and served with a honey-mustard dressing on the side. Grab and gorge on it while you can! We'll have you off kitchen duties in no time! Check out FreshMenu.com and order Now!